This month's transformation story is not about workouts, and fitness....instead it is about how healthy nutrition and choices can make all the difference when it comes to your health and wellbeing. 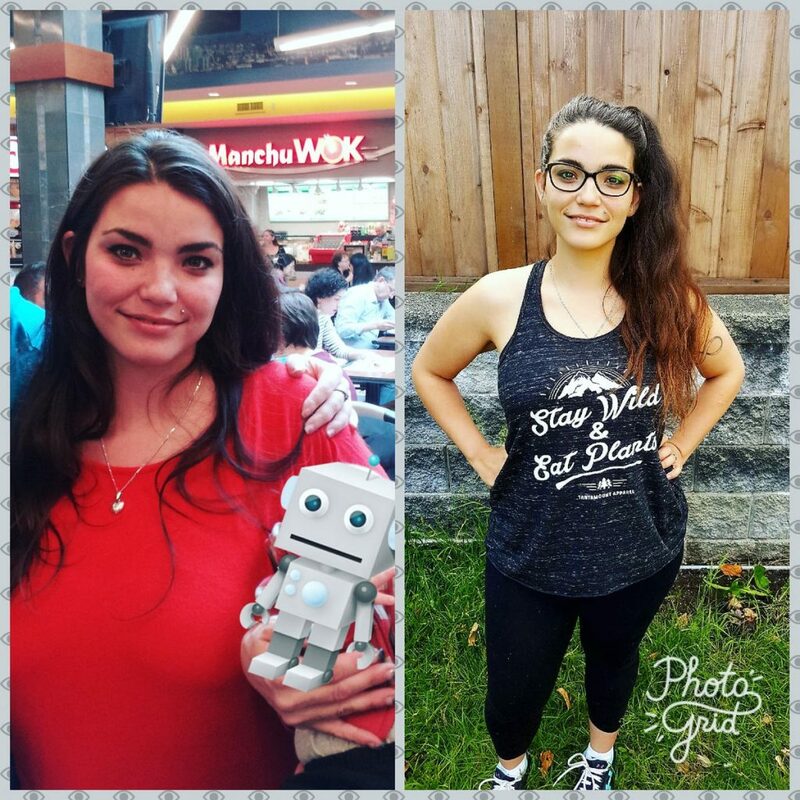 I am super excited to have Mandi (a mom of three) share her very inspiring story of how she went from totally unhealthy lifestyle, to extreme dieting, from binge eating to trying any possible diet method there is out there, only to realize that she is the only one in charge of her health! Read more to find out how she got in control of her own health and happiness, and make sure you check out her blog Big Tiny Steps for some inspiration and yummy recipes. My name is Mandi, I am a busy mother of three and content creator for Big Tiny Steps. I am 34 years old and everything I have learned about “adulting” seems to have been learned the hard way! I love to laugh and learn and I am on a quest to lead a healthier, more natural lifestyle. All of my adult life I struggled with my weight, and have had completely destructive relationships with my self image and food. I used to be a die hard smoker who would alternate between binge eating junk food or starving myself to reach my “goals”. I was unhealthy in my body and my mind, and I lacked the ability to see myself as worthy enough to make a healthy change. After a lot of soul searching, and years of making myself sick with products which promised quick fixes and using food as a therapist, I decided enough was enough. I made the choice to be an active participant in my own life and take control of my health on my own terms. I had just given birth to my second child and wanted to get my act together. I started to walk and move more. I took my baby out in the stroller until I was fit enough to try jogging. I decided to start eating mostly unprocessed food that would nourish me properly rather than make me feel heavy and exhausted. I tried to get my mind right and throw out weight loss as a goal. My true goal was self improvement and finding true health. This process and taking it slow allowed me to lose 70 lbs after my second child, and 20 lbs so far after my third. Have you tried any diets before? What were the results? I tried EVERYTHING. I tried pills, supplements, low carb, fasting etc. I also struggled with eating disorders for many years and although I would sometimes become thinner, I was sick, depressed, anxious and felt terrible. My mind was not in a place to seek true health. I thought of my kids. I am getting older and how can I be a good example of strength and self esteem if I am constantly destroying myself for superficial goals. I started thinking that what I was doing wasn’t working, and hadn’t for so many years, why not try something new. I read success stories from others and really took in how much of the journey is a change in mindset, and learning to think “I am WORTH being healthy”. I also would read very blunt advice from people who were saying “eat less and move more” and realized I had never given this a true chance before. However I don’t believe in eating less- I believe in eating BETTER. I eat so much more now but with whole foods and unprocessed junk you can eat so much delicious, beautiful foods that I am more healthy and satisfied than I have ever been. I made little goals step by step and would reevaluate each one as I went along. I tried to emphasize non-scale goals, such as endurance and strength. I constantly did check ins with my goals to ensure they were realistic. I forgave myself for slip ups. I sought motivation out to keep me inspired. I tried to use my own progress as a motivator, and learn to love myself enough to be my own inspiration. How long did it take you until this change became a lifestyle, normal part of your everyday life so to say? Maybe a month. That being said with my third pregnancy I had some unfortunate life stresses and fell back into “eating my feelings” and losing sight of my self worth. This is why I am starting over, and this time it was even easier. I felt so amazing before that this is a powerful motivator to get back where I was. I also started my blog to help keep me accountable and to help others who might just be starting out. I don't have time to work out so I pack up the kids and go for long walks in the stroller. I aim for 10'000 steps or more. I eat a mostly plant based diet that includes a lot of fruit and fresh vegetables. I eat frequently so that hunger doesn't get the best of me. I try and food that is beautiful and tastes amazing. I try to avoid sugar and sweeteners as well. I pack my own snacks (typically fruit and nuts). If I have to eat when I go out I hit up the grocery store rather than fast food, grab an apple or fruit/veggie tray. If this ends up being a bit more expensive than it helps me remember to plan better next time. Did this change affect your social lifestyle? It doesn’t much. Sometimes people have trouble when you choose to make a change but true friends understand and are supportive. If I go out to eat I plan in advance when I will have or I choose a salad or something that will hold me over until I can eat my own food. I also just wing it and have whatever I want sometimes. It's about moderation. My mental health improved dramatically. I feel clear, less anxious and happy. I have more energy and feel like my overall approach to life is brighter, and more positive. I lost enough weight to be able to walk and jog long distances. I can chase my kids without getting sore or winded! I have better self esteem because I am treating myself with care and love. You have 3 kids and are working, how do you manage such a lifestyle (workout and nutrition) while working full time? Plan ahead. This is the ONE component that will have the most results. Meal prep, plan your meals and have frequent check ins to make sure you are being realistic for YOUR life and circumstances. As far as working out, I don’t have that piece sorted yet (work in progress!) but I do know that even small walks or any bits of movement or stretching you can fit in your day are helpful. I will fully admit to dancing while brushing my teeth to reach my step goal before bed! Do you ever allow yourself unhealthy food? Sure do! I have Chocolate, ice cream, and chips from time to time. One thing I do is try to change my junk food choices. I now have dark chocolate with sea salt instead of a milk chocolate candy bar. I don’t like dark chocolate so I have one that is 70%. I only have a little bit instead of just eating a whole bar. I also will have frozen greek yogurt instead of regular ice cream and load it with fresh fruit so I have less. When I have chips I try and measure out my servings so that I don’t go crazy. Letting go of the guilt when eating unhealthy was one of the mental shifts that brought me success. If I eat unhealthy food it is because I made that CHOICE. I am the captain of this ship! So much fruit! Berries, melons, you name it! Also lettuces, bell peppers, onions, and jalapenos. For sauces- Sriracha is favorite, and salsa! What did you learn about you throughout this lifestyle change? My life is in my hands. I have the power to make changes if I am READY and feel they are worth making. I am WORTH being healthy, and WORTH being happy. I am so much more than a number on a scale or a tag in a dress. I also learned that I am a truly boss cook. Who knew!? What kind of advice can you give to anyone looking to change their lifestyle to a healthier one? It is easier than you may think. I made these changes with no time and on a tight budget. I am truly lazy and if I can do it so can you! All you need is the drive to make a change, the perseverance to make it fit your life, and the mindset to let go of any hang ups or any little perceived failures. Seek out support and community in your journey and you will see that a healthy lifestyle change is totally possible and there are others that will be happy to be there for you through the process.